Adjacent to Stonegate Real Estate is the 23-acre Stonegate Equestrian Park located just outside the community. Built in August of 2001, the facility features two riding arenas, plus playgrounds, restrooms and picnic shelters. The park was recognized as an Outstanding Facility in 2002 by the Arizona Parks & Recreation Association. 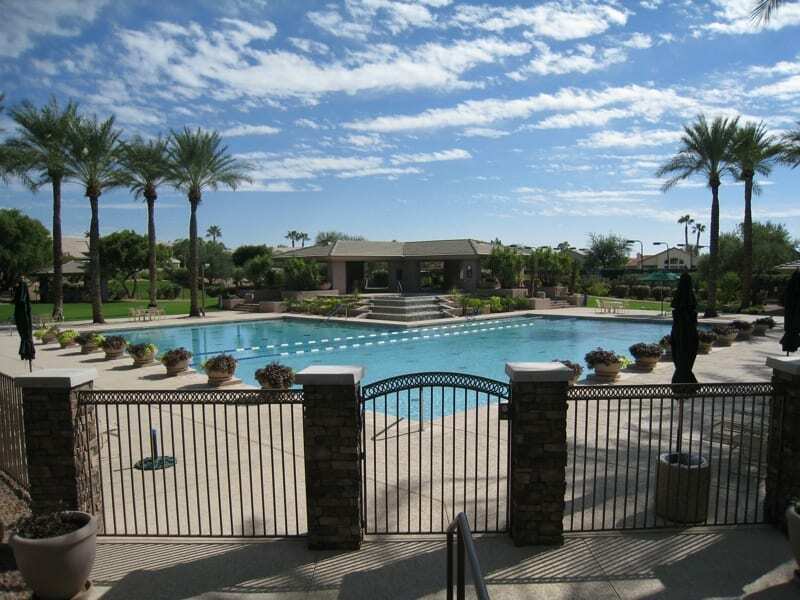 Close to Stonegate real estate is Scottsdale Ranch Park, Tennis Center and Cactus Park. In addition, Scottsdale Ranch Park that is spread out over 42 acres with open space and sports facilities. There are courts for racquetball, volleyball, basketball and squash, plus baseball fields. In addition, the Via Linda Senior Center, Laguna Elementary School and Piper Branch Boys and Girls Club are located on site as well. Children who reside in Stonegate attend Laguna Elementary, Mountainside Middle School and Desert Mountain High, three of Scottsdale’s A+ schools. At Stonegate, buyers are drawn to the lush landscaping, gated access control and the wealth of nearby amenities. Most of the available homes have at least three bedrooms and 1,800 or more square feet of living space. Some properties have five-bedroom, five-bath homes with 4,000-square foot floor plans. Home values in Stonegate start at about $400,000 and range up to $1.5 million. 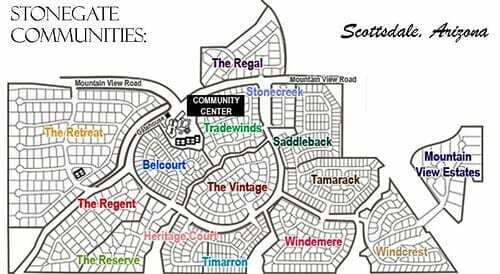 Stonegate real estate consists of the neighborhoods that follows: The Retreat, The Regent, The Reserve, Heritage Court, Timarron, Belcourt, The Vintage, Tradewinds, Stonecreek, The Regal, Saddleback, Tamarack, Windemere, Windcrest and Mountain View Estates. Not only do you have the benefits of Stonegate, the city of Scottsdale is brimming with activities that suit every interest and taste. From museums and art galleries to national forests and lakes, there is always something to do. Stonegate homes for sale are close to several art galleries and museums, including the Naked Horse Gallery and the Canyon Ridge Gallery. Stonegate is conveniently located just off Loop 101 and is only minutes away from local schools, hospitals, sport complexes, shopping and dining. Outdoor enthusiasts enjoy their weekends fishing and boating in nearby Bartlett Lake or hiking in the Tonto National forest.